I have never made any secret of my penchant for Chase products. A quick perusal through the archives of this blog is testament to my unerring love for all things Chase (see list at the end of this post), which began with their Elderflower Liqueur (better than St Germain) and now encompasses, pretty much everything they make; a great deal of which, you will find, weighing down the shelf in my studio, dedicated to my home bar. So, when I discovered that the Chase Distillery is not only open to the public, but is situated in Hereford, a hop, skip away from my parents' home in Great Malvern, it was only a matter of time before I made the pilgrimage there. Luckily, an opportunity presented itself, last week, when we were staying with ma and pa for a few days and Chase Distiller, Alex Davies, kindly offered to show Mr TG and myself around Chase HQ. After a leisurely lunch at the Orange Tree in Hereford, who, of course, stock Chase products (Chase Marmalade Vodka is a big hit apparently), it was off for a magical mystery tour of the farmland of Herefordshire in the back of a navigationally challenged cab driver, until we finally arrived at our destination. The distillery is located within the acreage of Rosamaund Farm, which was what confused our taxi driver, but actually, upon arrival, the numerous, Chase branded crates, dotted around the farm buildings, make it very clear that it is the home of the distillery. We were greeted by a very friendly, but somewhat hot and bothered, Alex Davies, who had just descended from the dizzying heights of the rectification column where the vodka undergoes its final distillation processes. The column is the tallest in the world of it's kind and the temperature at the top, on a day when the temperature outside was nudging 30 degrees, was pretty fearsome. After a pre-tour tasting in the Distillery shop/bar, of the award winning, original Chase Vodka (made from potatoes, with a distinctive, smooth taste and creamy finish) and my first try of Naked Chase (a vodka made from apples, with a crisp finish, residual sweetness and light apple aroma), we took a stroll in the sunshine, around the the potato fields and apple orchards, where the ingredients that made our vodka, are grown. Before moving into the spirits industry, William Chase, owner and founder of Chase Distillery, owned the Tyrrell crisp company, which is why Chase Vodka is made from Lady Claire potatoes, a brand that is highly regarded in the crisp making business, as it stores well and crisps up beautifully, when fried. Thankfully, it also makes rather marvellous vodka and with an abundant supply of them right outside their door, you know that Chase can account for every process that their drinks go through. Likewise, the apple orchards are in plain view of the distillery and you can be reassured that the journey from orchard to bottle is a matter of yards, rather than miles. The homegrown apples are used to make the Naked Chase Vodka, which is also used as the basis for their Elegant and Extra Dry Gins. It is this accountability from produce to spirit, that makes them quite unique in the distilling business. It may surprise you to learn that gin is essentially made from vodka and in most cases, from a base grain spirit that is bought in and then distilled with botanicals, the main one of which will be juniper. There is no secret to this and it's not necessarily a bad thing, but having been to the Chase farm and distillery and seen the very apples and potatoes that made my drink, I do find it reassuring to know exactly what's in there. So you see, the reason Naked Chase is so monikered, is because it is basically, the gin without all of the botanicals and it says a lot for the quality of the product, that it is an exceptional drink in it's own right. After a brief tour of the fields and orchards, we escaped the heat of the sun and headed indoors to the distillery, where Alex talked us through the processes that the potatoes and apples undergo, before they can be bottled and sold. There's a machine that sorts and washes the potatoes, before chopping them up and pushing them through a ricer to make them as fine as possible before they begin the fermentation process in the tanks, with the help of brewers yeast, until they form a low alcohol, potato wine. Apples begin fermentation more easily and so, are added, without yeast, into these huge tanks, where their progress is closely monitored as they turn from apples, in to a flat, dry cider. It is then that the potato wine, or cider is transferred to the copper batch pot where it is distilled around four times over, before it's final distillations in that enormous rectification column which is so tall, it extends through the ceiling and into the next floor of the distillery where all the botanicals are kept. As you might imagine, the botanical storeroom smells divine and I got to inhale the gorgeous aromas of rose petals, cinnamon, citrus peel, star anise and goodness knows what else; all of which are used in Chase gins and their Summer Cup. Before the botanicals come into play, the alcohol must be tempered down from an eye watering 96% abv to a more reasonable 40% abv, and then it's here in the copper batch pot, that the Naked Chase apple vodka is distilled once more, with the botanicals, to make the Elegant and the Williams GB Gin. Apparently, the botanicals are popped in a pillow case and the alcohol vapour passes through this before condensing back into into liquid, which is then infused with the beautiful botanical mix. For the Elegant Gin, it's a more delicate mix, including elderflower, angelica, juniper and citrus, whereas the GB Gin is a lot more punchy, with big spicy flavours of nutmeg, cinnamon, cardamom and cloves. For me personally, I prefer the flavour of the GB straight up, but it's so powerful, it can overwhelm some cocktails so the Elegant works well too. There's definitely a place for both in any gin lover's, drink's cabinet. 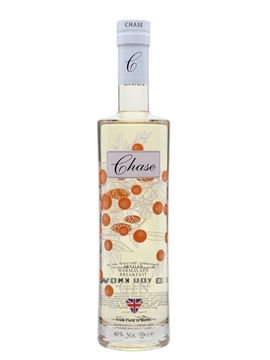 There is even more choice now, with the addition of Williams Seville Orange Gin; Chase Elegant Gin,distilled once again, with the same Seville Orange peel used in their delicious Marmalade Vodka , to give it a distinctive, yet still delicate, citrus and floral note. As well as Marmalade Vodka, Chase produce Rhubarb Vodka and Bramley Apple Vodka, all of which are delicious, great for cocktail making and all made in that hard working copper batch pot. They also produce a great range of liqueurs, of which, my favourite still has to be the Elderflower, but that's not to overlook the raspberry and the blackcurrant, both of which are perfect for any cocktails requiring either Creme de Framboises or Creme de Cassis, as they are both made from all natural ingredients so that the fruit flavour really shines through. Finally, when the distillation process is complete, they are ready to be bottled, a process that is all done by hand. The drinks are poured into the bottles which are then finished with cork stoppers and a foil or wax seal is applied, before they are boxed and sent out around the world. It's fantastic to think that these relatively, small batch products are made right here in the UK and are receiving worldwide acclaim. 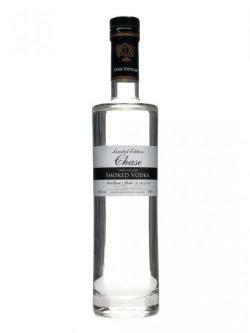 The one product I was most intrigued to try, was the highly acclaimed Chase Smoked Vodka. It is so completely different from the rest of the portfolio of drinks, but such an incredible and unexpected pairing of flavours. The initial aroma is very smokey, obviously, and quite savoury - it's perfect to serve chilled and neat, with smoked salmon or gravlax, but actually, it can work well with sweet flavours too. It's definitely one to experiment with and of course, I couldn't resist buying a bottle to try at home. 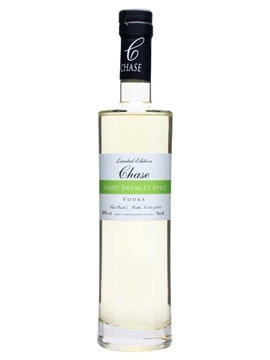 I also, bought the Chase Bramley Apple Vodka because it is downright delicious and I wanted to complete my fruity vodka selection and finally, I took a bottle of their Summer Cup, which I really like as it's quite overtly berry flavoured, using locally sourced raspberries and blackcurrants, as well as being infused with flavours of rosemary, rose, lavender, elderflower and earl grey. Slightly woozy from sun and sampling, we wound our hazy way back to Hereford Station in a taxi that thankfully, knew where it was going and agreed that it was a most pleasant excursion and a must for anyone who loves good quality booze and a British success story. Chase Distillery is open for public tours on Fridays and is well worth the £10 ticket price, which includes a £5 voucher, redeemable against any purchase over £20 in the shop, and trust me, you'll need it. I defy anyone to leave there empty handed! Apple and ginger is a winning combination. The warmth of ginger and the tart, sweetness of apple are a lively combination and for this drink, I used as my inspiration, a favourite of mine, the Penicillin cocktail, which uses honey/ginger syrup and lemon juice with a single malt, to great effect. This combination is also really great with Chase Smoked Vodka, but for today, we're going for a different, more fruity finish, that is sure to appeal to most. Add all of the ingredients to a shaker with ice and shake hard for about 20 secs. Add all of the ingredients, apart from the bacon, to a shaker and shake hard for about 20 secs. Strain into a chilled martini glass and garnish with the bacon. Add the vodka, syrup and espresso to a shaker with ice and shake hard for about 20 secs. Most Espresso Martini recipes require a coffee liqueur, but trust me, with these ingredients, you won't need it. This syrup is just incredible and the smoky flavour of the vodka works so well, you couldn't imagine it any other way. You can order Clement Sirope de Canne (and Chase Smoked Vodka for that matter), from Amathus Drinks. I bought mine from their City branch on the recommendation of the highly knowledgable staff and have not been disappointed. I first made this cocktail for a post called Mother's Ruin and in it I used a different gin and slightly less lemon juice. I found the drink to be so much more enjoyable, made to this recipe, which illustrates perfectly, what a difference, very slight changes can make to a drink. Experimentation is key to finding out what you really like and if it's not the 'classic' way, it really doesn't matter, as long as you love it. Add all of the ingredients, apart from the apple round, to a shaker and shake for about 20 secs. Strain into a chilled martini glass and garnish with the apple round. Of course, this is only a martini in the sense that it served in a martini glass, but it crisp, floral, sweet and fresh, without being too strong. A lovely drink for a summer's afternoon. Great post - I love Chase vodka and it's fab to read more about the company and distillery.